several years ago, a group formed based on the same premise as Project Runway–issue a challenge with some parameters with a due date of one week. The Challenges have varied from quite rigorous art studies to useing new techniques or materials–but in general a stretch to come up with an idea and execute it within one week. The only thing missing was a budget and a trip to a fabulous fabric store–or garden center or recycling center–etc. this month’s challenge was to illustrate something that might happen in the make believe world of Loopiland. 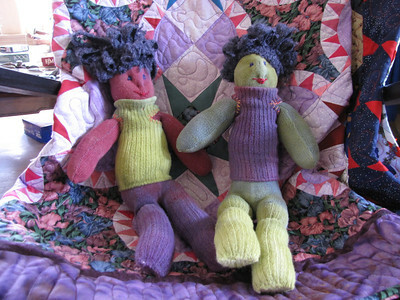 I thought the planet needed to be populated–and so I created the Loopy Twins–from bamboon socks with worn out toes and a knit boucle fabric in loops for hair. I am two days late in posting–but the twins were done on Thursday night.